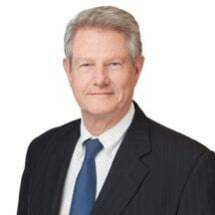 David was born in Odessa, Texas; graduated from Permian High School; is an honors graduate of the University of Texas at Austin (1972) and the University of Texas School of Law (1976); and has practiced law since 1976. David served as an Assistant Attorney General of Texas from November 1976 until September of 1979, when he joined the law firm then named Gibbins & Wash. David was a general partner in that firm doing primarily insurance defense litigation for several years before leaving to form Tulk & Deaderick, L.L.P. David was a partner in Tulk & Deaderick, L.L.P. for 15 years. After Richard Tulk retired in 2000, David became a partner in the litigation firm of Grove, Ehlinger & Deaderick, which after the retirement of Bob Grove, became Ehlinger & Deaderick until Ross Ehlinger's death in 2013. David then practiced as the Law Office of David Deaderick until joining Wright & Greenhill, P.C. in 2016. David is licensed to practice in all state courts in Texas; the United States Supreme Court; the U.S. Courts of Appeals for the 5th and 11th Circuits; and the U.S. District Courts for the Northern and Western Districts of Texas. He is a member of the State Bar of Texas, the Travis County Bar Association, and the Texas Association of Defense Counsel. David served for three years as a member of the State Bar of Texas Administration of the Rules of Evidence Committee. David's practice is limited to litigation, primarily insurance defense or insurance-related trial work. Some of the insurance companies for which David has handled cases are the American International Group, Crum & Forster, Firemen's Fund, the Great American Insurance companies, Gulf Insurance Group, mercury Insurance Group, the Texas Farm Bureau Insurance Companies and Germania Insurance. The types of litigation David has handled through the years include all forms of personal injury litigation, products liability litigation, professional liability (insurance agents, lawyers, doctors, hospitals, nurses, dentists, engineers, psychologists, social workers, and real estate agents), construction litigation, deceptive trade practices litigation, insurance litigation (including "bad faith" cases) and defamation cases.